I have adapted my date kefir levain bread for those of you who don’t have kefir grains and are maybe not as fond of tending small bubbling pots as I am! This is an experiment to see if I can approximate the same loaf using a small quantity of dried yeast and yoghurt to replace the kefir. I have used spelt for the wholemeal component of the dough which gives a lovely warm nuttiness to the final bread. It is sweeter, softer and even a little stickier than the original kefir bread, even though it has the same proportions of flour and yoghurt/kefir. I can only speculate as I can’t do a proper analysis on the loaf, only rely on taste. It does however make me think that most of the date syrup is converted by the kefir’s unique culture in the original recipe into gas and acids, giving it a more complex and interesting taste and texture. I will reduce the quantity of syrup by half if I make this yeasted version again but I will write it out here as I made it. Prepare a preferment as above with flour, yoghurt, dried yeast, warm water and date syrup. I use our home-made yoghurt, which is very thick and sets solid, if yours is runny then you may find you need less water in the final dough. Mix the pre-ferment approximately 18 hours before preparing the final dough. The pre-ferment should be thick and bubbling vigorously when you mix the final dough. Mix the final dough (ingredients and weights below) using a stand mixer or by hand. I used a stand mixer. Melt and allow butter to cool slightly. This dough takes more water than the kefir version as the yoghurt is thicker. Leave for 15-45 minutes in the mixing bowl. Turn dough out and check that is quite soft and beginning to develop. Place in a (lightly oiled) bowl and cover. Prove for 4-6 hours depending on room temperature. I stretch and fold the dough in the bowl twice during this time. Divide into two equal portions and shape according to preference, you could bake in a tin, or use a banneton to hold the dough while it proves. Pre-heat oven to 230 C / 450 F.
Leave to prove a second time for about an hour and fifteen minutes, if you had a long first prove like me! Providing you were gentle with your shaping and didn’t knock all the air out of the dough you should get good oven spring. Bake at 230 C or as hot as your oven goes for 20 minutes with steam until the loaves have sprung and started to brown. Open door to let steam out briefly and drop the temperature to 200 C / 400 F and bake for another 20 minutes or so. Allow to cool on a rack. A 700 -750 g (unbaked dough weight) loaf takes approx 45 minutes to bake. I have been having a great time beta-testing the BreadStorm ™ app for the iPad the last few weeks. I have the free version at the moment on my Mac desktop but I really like the idea of having an iPad version, as the iPad is easier to have in the kitchen and I will be very tempted to buy it when the beta-testing is finished. being able to exchange files with other bakers in a common format, the .bun file. being able to scale recipes up and down to fit my needs. This can be very complicated if there are lots of pre-ferments and soakers in the recipe and I am very good at getting that sort of thing wrong! it also encourages me to think a bit more logically, and anything that does that is a good thing! If you want to read and explore this software further and the differences between the paid for and the free versions, do visit the BreadStorm site and also visit Farine’s blog as she knows the software and writes in far more detail than I do about how it all works. If you don’t know Farine, she is probably one of the finest bread bakers and writers you will come across and I really respect her skill and craft more than I can say. Jacqueline, one of the developers, has also written a tutorial which you can read here. and wonderful Karin @ Brot & Bread has written a fantastic post on her detective work with her colleagues at The Fresh Loaf Forum figuring out how to make Cecilienhof Vollkornbrot . Karin also uses BreadStorm ™ software and a lot of other people are using it too already. I think it is going to be very popular. Disclaimer : I haven’t bought any software yet, I am not being paid to write about BreadStorm. I am simply testing it out as you would a cookbook. I volunteered to be a tester, my help was not solicited. Any opinions are my own. 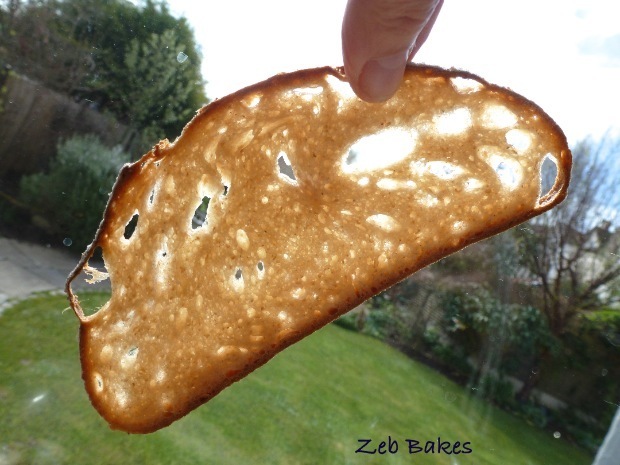 I baked a different loaf using yoghurt whey four years ago, far more acidic than this – it was the first loaf that I wrote about on this blog and the first one I took a joke ‘windowpane’ shot of. I have baked and written about rather too many loaves since then, so thanks for reading this mishmash of a blog everyone. You have been great! Zeb Bakes Anniversary Photo – a little bit of fun! And for those of you with the stamina to read this far, an anniversary picture of Zeb with an old friend from a long way away in the garden. Zeb came across her while looking for elves this week on April Fool’s Day. The mist had lifted and we teased Zeb that this one had stayed behind to pick some primroses. This may be a bit obscure so here is a picture to explain a bit more – In Sweden the elves or fairies are said to dance the morning mist which lies low over the ground – the ‘Älvdans’ – I was reminded of this by ‏@Scanditwitchen who is a font of knowledge about all things Scandianvian. That looks like a great way to keep track of your recipes. Happy anniversary to a great blog! Looks wonderful – I have never baekd with spelt but am looking forward to trying it out in a week or so when I am back in England. Can’t find it where I am in Andalucia! I love the way Zeb appears to be is staring so intently at the fairy!!. How did you manage to weigh your .5 g ‘s so accurately Joanna I have the KD8000 but find it quite hard to even get 1g accuracy as I like to do long ferment low yeast? Thank you for a wonderful post !! He is good at concentrating on things :) The answer to that is that In practice I round up all the numbers to the nearest whole number and just do my best. I have the KD8000 like you, and it doesn’t weigh one gram on its own does it? If you mean the yeast in the above recipe then I used a measure that does ¼ tsp by volume, primarily so I could replicate it for myself again. There are small scales one can buy, for weighing precious metals, drugs, etc but I don’t have any of those. I am so pleased to hear you enjoyed the post, thanks Helen! I have both milk and water kefir and whilst the latter lasts a few seconds, the former does tend to hang around a bit. Probably because I also make yoghurt and we tend to eat the yoghurt and cook with the kefir. I’m interested in your cheese recipes too. I make our own soft cheese with rennet. Which also means I have shedloads of whey which I have been using for bread or feeding to our dogs and chickens. I did try making ricotta but it wasn’t a huge success. I have also tried a mozerella recipe that produced the closest thing to india rubber I have seen for many a year! So (finally getting to the point!) I am definitely going to give your date kefir loaf a try. But a quick question, I don’t have any date syrup but have plenty of pomegranete syrup. Whilst I appreciate the flavour will be different, is date syrup of a similar consistency and do you think the substitution would work? I make yoghurt separately and make fairly small quantities of kefir usually and mainly use it in bread or just simple labneh type cheese. I don’t have any cheese recipes. Carl Legge has done some kefir cheese and you might find them on his site, or Dom’s encyclopaedic kefir site, I think the links are on my kefir posts. Love Zeb and his gnome! That bread looks delicious – two of my favourite things, spelt flour and date syrup, so will definitely give it a try. Bakery Bits has a spoon scale which I find useful for weighing small amounts, though I haven’t ever needed to be accurate to 0.5g! Ha, Joanna, you made my Sunday (and boosted my ego!) with your extremely nice comments! This will be my next bread, though I don’t know whether I will manage to get the sun shine through a slice. At least spring is very slowly arriving, my botanical crocuses are blooming, and my precious hazelnuts have thick buds. I’m really happy with BreadStorm, it is so easy to change the hydration or check the salt percentage. Slowly I will revisit my earlier blog posts and put the BreadStorm formulas in. Maine is in the Northeast, bordering Canada. Though we live on the coast, on Mount Desert Island (next to Acadia National Park), where it is a bit milder, we had a really rough winter. But now the sun is shining, and the snow is finally melted (causing big puddles in our basement). So much interesting content in this post Joanna – Kefir and spelt are ingredients I want to try – I should be very happy if I could turn out a loaf like that – as well as understand the process! 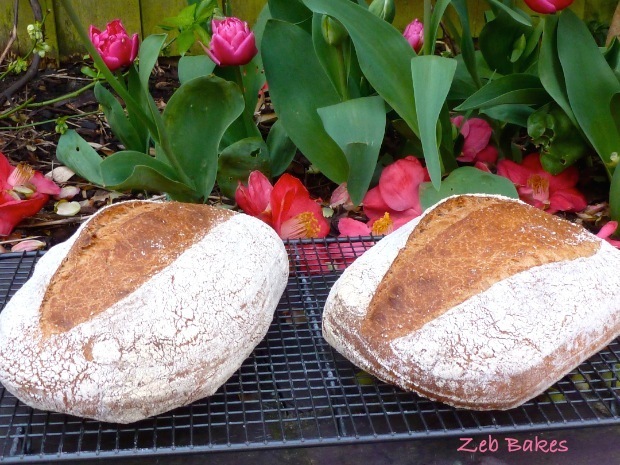 The photo of the bread and the vibrant blossoms is beautiful as is the photo of Zeb contemplating the fairy. I’m in the process of explaining fairies to my middle granddaughter – she didn’t believe in them – imagine that…exactly, thank you. Where she is living at the moment mists are extremely rare – it’s inland in north west Queensland – mostly hot and dry, nevertheless I’ll show her that picture. Rain is currently lashing our office window and I should love to be home and cooking -but I’m not so I must pull myself back to the real world. Love Zebedee. Also, fantastic bread. I picked up a lovely malt loaf from Source on Friday and have polished it off rather quickly. That app seems really useful – I do like the tables it produces. Hope you’re enjoying the sun! I have been in your native land this weekend :) Sunny there too, Zeb has been practising his 400 yard beach sprint and has regained his waistline which is more than I can say after eating too many Welsh cakes ! Happy anniversary! And thank you for all these whimsical and useful posts :) Keep them coming! The yoghurt loaf looks very moist indeed. The next flour on my list shall be whole spelt, with your recommendations. Re Breadstorm, Jacqueline actually emailed me the earliest version to test, but it came at a time when I was very busy and I clean forgot about it. I would like to give it a go again, but I’m too embarrassed to ask. It does seem very useful though. I’ve seen it popping up everywhere! love that picture of the fairies. And Zeb is very good to leave his dolly friend alone. My old dog would have shredded it in no time. You are very kind, thank you ! I am getting more enamoured of BreadStorm the more I use it, I am not sure if they are still asking for volunteer testers to get in touch, but if they are why not try? I didn’t leave Zeb alone with the gnome at all, he is a bit of a shredder too !